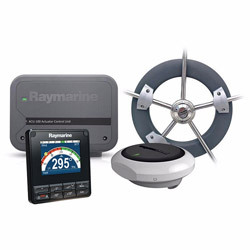 Add the safety and efficiency of an autopilot system with the easy-to-install Raymarine Evolution EV-100 Wheel Autopilot package that includes a P70s Control Head. Designed specifically for sailboats, this package features the P70s Control Head with push-button operation, advanced LED backlighting and a wide, 160-degree viewing angle so you can easily check the display from various positions. The EV-1 Sensor Core combines advanced solid-state sensors with the Evolution autopilot processor in a single, easy-to-install housing. This system tracks pitch, roll, yaw and heading from a 9-axis monitoring system. Integrated aerospace guidance technology creates Evolution Ai control algorithms so your autopilot responds instantly as sea conditions and vessel dynamics change. And the start-up wizard helps you configure the pilot quickly and easily with no compass calibration required.